Curved stairlifts are custom built and so the costs are much higher than traditional straight stair lifts. They have to measure your curved stairway to its exact measurements. A curved stairway will require more maintenance and experience more wear than a standard straight stairway. This is because of the curve and the physics involved. There is a lot of strain on the curves. If possible, it might be cheaper to replace the curved stairway and install a straight stairway just for the stairlift. Another option is to buy a reconditioned or used curved stairlift. Due to the complexity of a curved stairway, the prices will always be more expensive than a straight stairlift. Prices may range from $7000 to $15000. If you have a landing spot on your stairway, it may be cheaper to install two stair lifts on your staircase than a single continuous curved stairway. Purchase one stairlift for each section and have a wheelchair, handicap aid like a cane or walker, available at the landing. 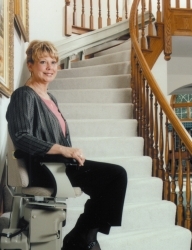 Find a stair lift dealer and manufacturer in your local area to get your best estimate and service. A curved stairlift will prevent the number of potential accidents that can occur just by walking up and down a stairway. Another benefit is reducing the amount of strain on your knees and hip joints. Most importantly, it will allow you to live independently and enable you to enjoy your home without restrictions. The next time you want to read a book that is located on the second floor, you will not have to hesitate to get it. That is the quality of life that handicapped equipment can provide and that everyone should have.